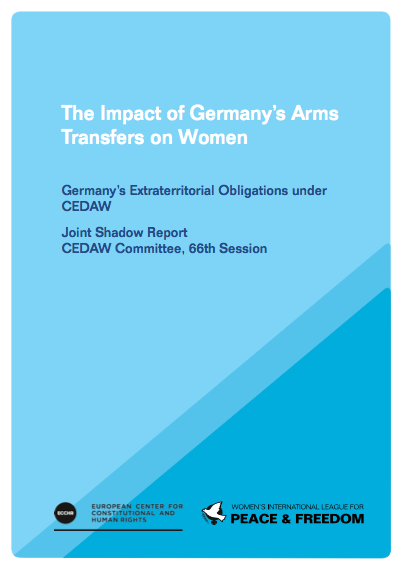 Arms transfers can have serious consequences for the rights and safety of women in the countries that receive them as well as in places where they are not meant to go, especially in the case of small arms and light weapons. The proliferation of small arms and light weapons, both in wartime and non-conflict situations with significant political tensions and systemic gendered discrimination, may disproportionately affect women. Furthermore, the use of weapons of indiscriminate effect, such as explosives, may have particular implications for women who may be affected by the destruction of infrastructure or the burden of caring for the wounded, particularly in a context of inequality. See the whole report as PDF.